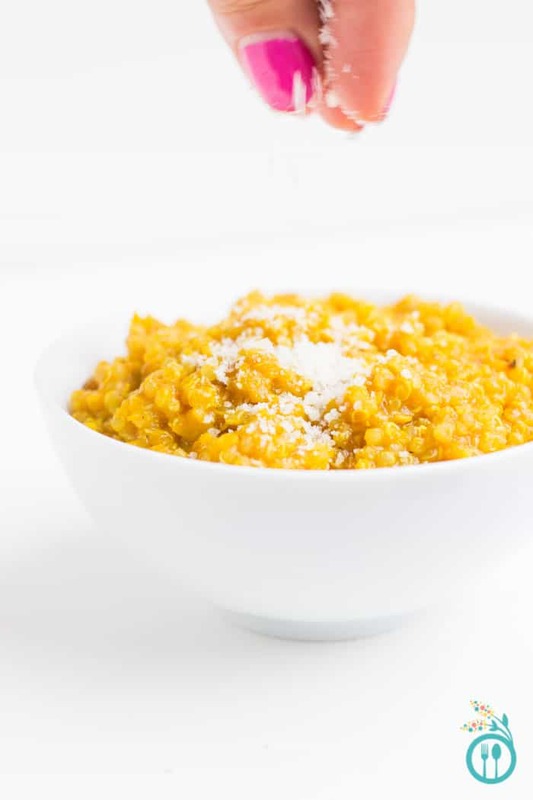 This vegan butternut squash quinoa risotto is creamy, flavorful and perfect for fall. 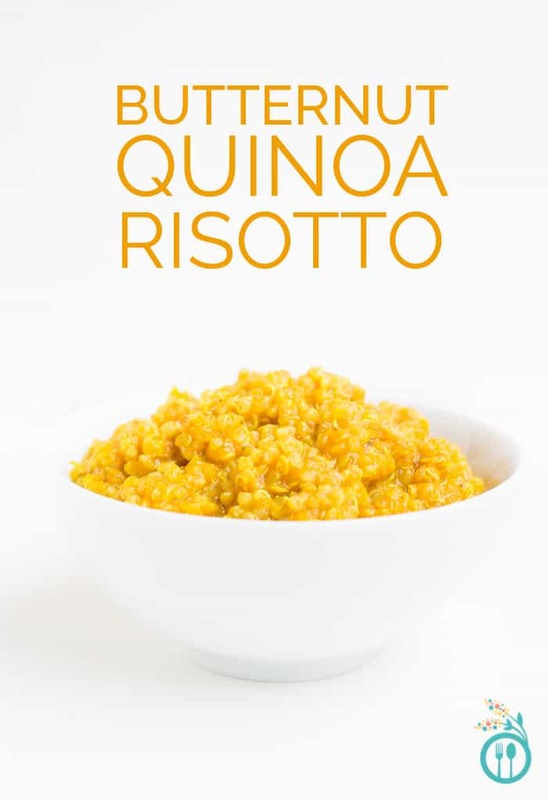 Whether you're looking for a simple meatless meal or want something healthy to serve at Thanksgiving, this quinoa risotto is just the dish. Watch how to make it in this video! I have been wanting to make this recipe for ages. What was stopping me? Who knows. But now it’s here and I’m practically jumping out of my seat I’m so excited to share it. 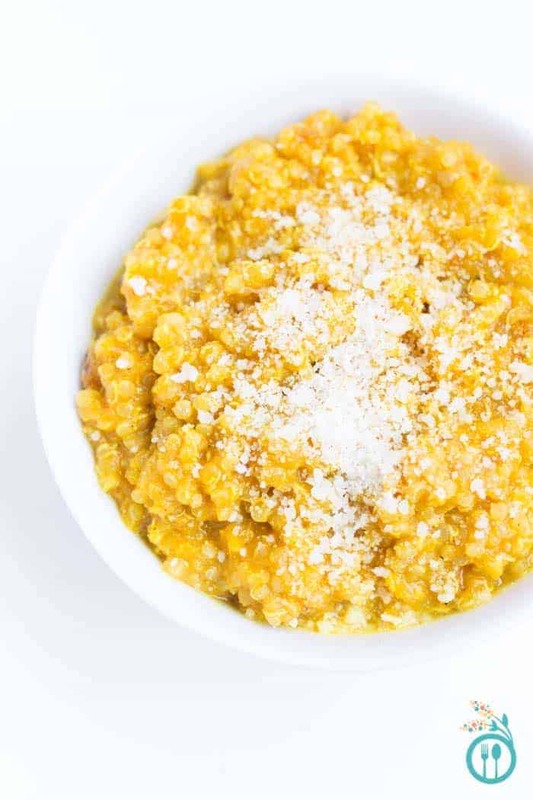 Today we’re having a creamy, dreamy, autumn-inspired, “risotto”-style quinoa dish that is going to knock your socks off. 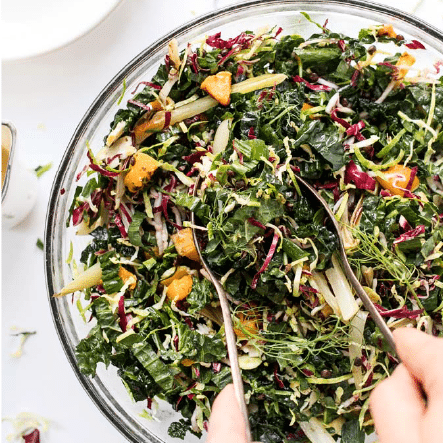 It’s rich, with earthy tones from roasted butternut squash, it has a delicate, soft texture and couldn’t be easier to make. Simplicity at its finest right here. Traditionally, risotto is a not so healthy, dairy-filled, heart-attacking-waiting-to-happen dish that takes forever to make. Yes, it’s sinfully delicious, but the fact that you have to pay so close attention to it, and it could make you cause you some major pain, gives me more than enough reasons to steer clear. Or at least find an easier, healthier way to prepare it. Which is exactly why quinoa is a great choice for risotto. For starters, normally quinoa takes less than half the amount of time that it takes rice to cook. But when you’re doing it risotto style, you can cut the cook time down by at least three-quarters. So a dish that might take an hour to cook will take you 15 minutes with quinoa. The second thing I like about quinoa risotto is that by itself it has a fairly boring (well, let’s say plain) flavor. You know, it tastes kind of like plain quinoa; not bad, just not exciting. 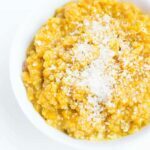 But when you add in just a few ingredients, in this case butternut squash and romano cheese, the quinoa transforms into this luxurious dish, full of deep flavors that awaken your palette and make your taste buds smile. And who doesn’t want smiling taste buds? The third, but not necessarily final, thing I like about quinoa risotto is that it’s really easy to make healthy. There’s no need for butter, cream or cheese, you can cook it using a simple blend of stock and/or water, add in your desired ingredients, let the mixture slowly thicken and you’re left with a perfect pot of “risotto”. For today’s recipe, I decided to follow my heart and go the butternut squash route. I’m a sucker for anything squash in the fall, especially when it involves something creamy. 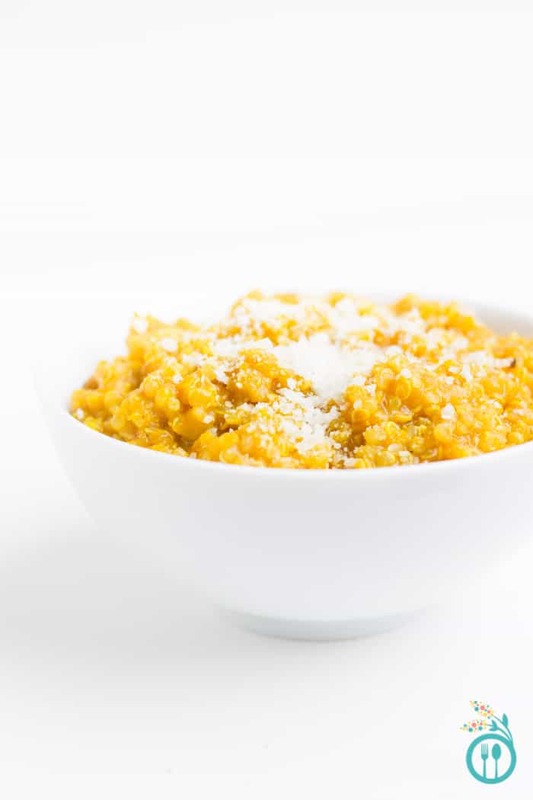 This butternut squash quinoa risotto is everything I hoped it would be. 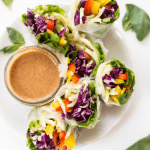 It packs a ton of autumn flavor in each bite, takes fewer than 10 ingredients, cooks in under 30 minutes and is actually so healthy that you could eat it for breakfast, lunch or dinner. Which gives me an idea…top this recipe with an over easy egg and you’ve got yourself the perfect autumn breakfast – yum! Toss the butternut squash with coconut oil, cinnamon, paprika and season with salt and pepper. Transfer to a baking sheet and roast for 20 minutes. Stir the squash around a few times so it cooks evenly. While squash is cooking, add quinoa and vegetable broth to a sauce pan. Bring to a boil, cover and turn down to simmer for 10 - 15 minutes. The quinoa should be soft, but there should still be some liquid in the pot. Remove squash from the oven, transfer to a bowl and mash it with a fork until almost smooth. Add squash to the quinoa, stirring to combine. Sprinkle in nutritional yeast (or cheese) and cook for another 1 - 2 minutes. 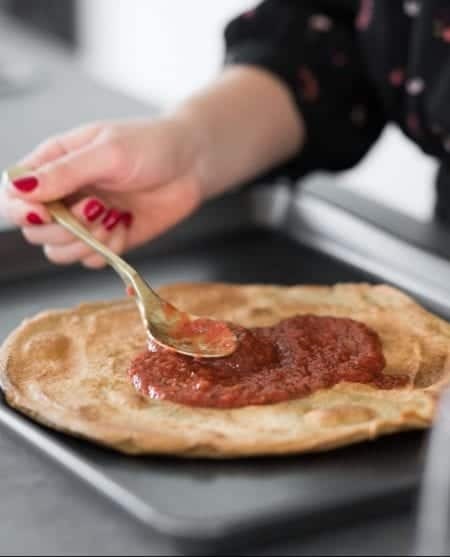 Serve immediately and garnish with additional nutritional yeast (or cheese) and a drizzle of honey. Thanks for this. I adapted the technique a bit, halving and roasting the squash instead of peeling and cubing and omitting the cinnamon. When it was done I just scooped it out since it was mostly puree texture. It was a big squash, so there were some firmer pieces in the center, which I cubed and put aside. I also sautéed a few shallots in olive oil and mixed in some dried thyme and added that to the squash. After the quinoa was done, I stirred in a few handfuls of fresh spinach which I had chopped, and stirred in the pot until it wilted. Once it was all mixed together and the cheese was melted, I stirred in the firmer pieces and added fresh pepper. The green spinach gave such a nice contrast to the orange. Sounds absolutely lovely! Really glad you enjoyed it, Chris! Sounds great. Can this be made ahead of time? Hi, i suppose I can use sweet potato instead, wright? 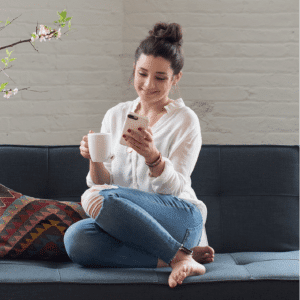 Clarification on nutritional information … is that 414 cal per serving? 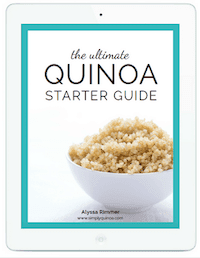 Alyssa you are my new quinoa guru! Made this recipe with red quinoa, b/c that’s all we had in the house, and it was delicious! Love the simplicity and that my toddler will eat it. Thanks. i attempted to make this dish and mine did not come out so vibrant 🙁 it’s more dark orange and not as well combined! How about a lemon basil quinoa risotto? Ooh this sounds delicious! I’m a sucker for risotto and it never occurred to me to swap it for quinoa. How about a Fava Bean Quinoa Risotto?